Hey everyone! I just wanted to take a moment to introduce myself here on TRANScendGENDER. My Name is Kathryn, and I began taking my first concrete steps towards transition a few months ago. Since then I have jumped in feet first. I guess after 30 plus years of hiding my true self, I can’t wait to let her out and set her loose on this world of ours! Since that time, I met some great people through a local TG group, one of those people being Tiana. Tiana got me into Yahoo 360°, where I really began to meet other girls from the larger Trans community. While not perfect, 360° did get me in touch with a lot more girls, and enabled me to feel like I was really a part of a larger community. For those of you I have already met, thank you for making me feel welcome, both on 360 and here, and for those of you I have not yet met, I look forward to getting to know you and sharing our stories and experiences. I am convinced that as long as we have each other, there is nothing that we cannot overcome in this wild and crazy world of ours. We just have to be proud and be strong! I wanted to introduce you to two people on the blogroll, one of whom has been quite active around these neck of the woods lately (and I like it!). Mari and Abby paid a visit to Tucson last week to attend the Tucson Folk Music Festival, and I had the opportunity to get out of the house and catch some great tunes with some terrific friends that evening. A brief summary to start with – I am female-bodied, and female-identified (Cisgendered, or Genetic Girl). My spouse of almost 13 years is currently questioning their own gender identity, which has made me reflect on my own life and discover how much of it has transcended gender norms and led me to a place where gender identity is almost a non-issue for me. I was raised in a small town in Southern England in the 1960s. My mother was a single parent, and we lived with two elderly, never-married sisters who had been friends of my late grandmother. Thus my home environment was very much a matriarchal one, with females performing all roles – driving, finances, home maintenance, breadwinner, as well as the traditional female roles. My mother maintained a fairly androgynous appearance and would frequently get “sir’ed”, much to her annoyance. One of the sisters ran a Cub Scout Troop which met at the house, and thus my earliest playmates were male. I preferred my ‘Action Man’ (G.I. Joe) to my dolls, my train set to my doll’s house, and spent many hours climbing trees and becoming a “little woodsman” in our vast backyard. To me, none of this seemed odd and the only difference I was aware of between boys and girls was that we used different public restrooms. 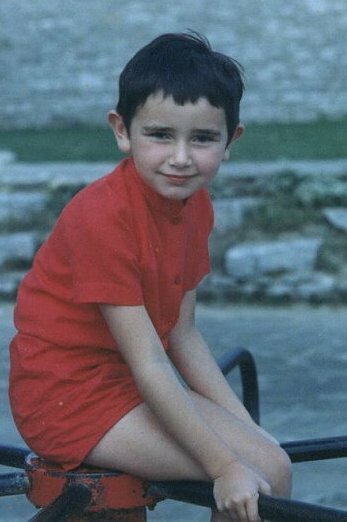 As you can see from the photo of myself aged 4, I looked like the typical ‘tomboy’.